Whats the greatest party youve ever been to? Be honest! Was it the one where you all stood around in little groups discussing politics, religion and the state of the economy and British sport? Or was it the one where you let your hair down and your knees up and had a right old fashioned good time. Ah, we thought as much, so to remind you, we at AVID have put together the soundtrack to that very party that you possibly may not remember that much about! From Agadoo to the Hokey Cokey, The Birdie Song to the Conga, from Barbie Girl to Happy Birthday and from YMCA to the Anniversary Waltz, AVID have got all your party requirements covered. 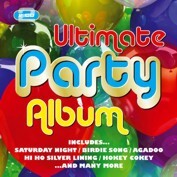 32 great party songs including all the classic party anthems on a double CD and at a fantastically low price. Its your party!